Learn the basics of how to use the lead routing page. Lead routing will share a lead with another team member when the lead is tagged. 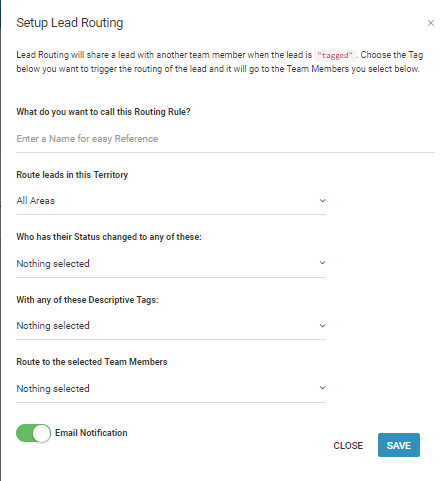 Users are able to choose the tag desired to trigger the routing of the lead and it will go to the team members intended. Leads can be routed leads based on tags to anyone on a team. Locate the 'Advanced' module on the left side of the page. You can route any new leads to another user on your team. You just need to setup a simple rule that tells us for each territory who you want to be able to see new leads when a tag is applied to a lead. Remember, you as the owner of the territory, will always see every lead. Select the territory or territories you wish to assign leads from. Select the status change that will be routed. Select the descriptive tags you would like to be sent over. Select the team members you wish to rout the leads to. Decide if you want email notifications sent to the selected team members. Make sure to click 'Save'. Search Terms: Leads lead, routing, routes, route, page, screen, dashboard, share, direct, assign.